Ever dream about living on a tropical isle (like the Dominican Republic)? It got me through many winter mornings, scraping ice off my windshield so I could go to work. "Fast-forward" to ten years later, and.....we're here!!! Living beach-side in the Dominican Republic! and the only thing I'm washing off our windshield is salt from the ocean breeze. Hola, I'm Lynda. 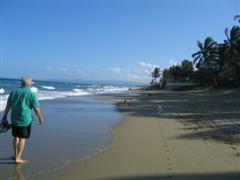 My husband (Les) and I moved to Cabarete (on the north shore of the DR) in 2004. We came to enjoy the climate and make some money with an affordable real estate investment with a superior return (ROI). Our adventures in that pursuit make us laugh (a lot! - I've never laughed so hard in all my life) and also shake our heads in total bewilderment. Ready to live your dream life in the Caribbean ? Find that perfect Caribbean property deal - that sounds almost too good to be true? Relocating abroad and living overseas can be a daunting challenge, especially in a third-world environment. It's much easier when you know more about what to expect and some "rules of engagement!" We're often asked, "What's it like living there?" This website gives you our answer to that question, sharing our experiences of living here. Instead of shoveling snow, we take our dogs for beach walks. Winter is our favorite season now. Year round temperatures feel like summer did back home. Big! Win! Dropping out of the rat race to live in the land of "manana" has certainly slowed our pace and taught us a lot. I took a lot of things for granted - like having full-time electricity and clear running water - until I didn't! There's nothing like "doing-without-them" to help you appreciate the basics. I know now (if you have to choose), having water is more important than power - who knew?!?!? Thankfully both are now in good supply, so we can offer our condos as "vacation rentals by owner" with confidence. That's a big √ in the "win" column, and we love to celebrate those! As our younger son would say, "keep going till you have a story." Who are the people in you neighbourhood? 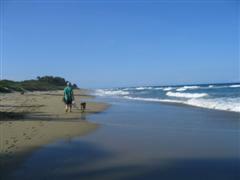 Our hometown of Cabarete changes year-round, hosting tourists from all over the world. See how you can afford this resort, Vecinos for sale - a slice of Caribbean life. It's your dream home that vacationers are happy to pay you for sharing with them. If a picture is worth a thousand words....our favorite photos must speak volumes! The DR Blog keeps you up-to-date with all additions and changes to the Our-Dominican-Republic.com Web site. Subscribe here. Underwater ocean world invites you to come scuba diving + meet our coral reef community !